Danny McKee was the hero for Ards as the north Down club ensured a place in the League Cup final by defeating Coleraine 5-3 in a penalty shootout. James McLaughlin scored twice to put the visitors in control but substitute McKee found the net with headed goals on 65 and 85 minutes to level at 2-2. McLaughlin missed his penalty in the shootout while McKee netted the winner. The Championship One leaders will face holders Cliftonville in the decider on 13 February. Coleraine began the game brightly as Lyndon Kane had an effort blocked by Ryan Brown, who also denied McLaughlin and Neil McCafferty with good saves in the opening period. The prolific McLaughlin opened the scoring in the 17th minute with a 30-yard shot which skidded off the surface and past Brown, who misjudged the bounce of the ball. Brad Lyons fired wide of the target before the break, while Denver Gage had opportunities to equalise for Ards. McLaughlin squeezed the ball under Brown from six yards out after 50 minutes for his seventh goal of the competition and his 16th of the season to put his side in charge. McKee pulled one back with a glancing header at the near post from David McAllister's left-wing cross and then squandered a chance soon after when he headed over the bar. The 'supersub' did find the target however five minutes from time with a header into the top corner from the edge of the area, before having a further effort chalked off for offside in extra-time. Coleraine substitute Ian Parkhill saw his attempt cleared off the line by James Cully and McLaughlin headed straight at Brown when well placed. McLaughlin was the only player to miss in the shootout, stumbling in his run-up before striking the post, and it was left to McKee to convert the decisive spot-kick. Ards manager Niall Currie: "Our boys showed tremendous character and Danny McKee made a big difference to us when he came on. 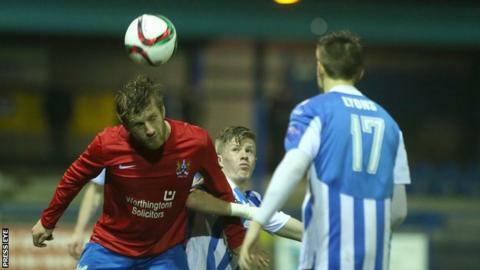 His pace caused Coleraine all sorts of problems. "I thought we were unlucky to go in a goal down at half-time and I told the boys at half-time that we were still well in it. "The sceond goal just after the break was a real bodyblow but we battled back, came more into the game and matched Coleraine in a lot of areas."